Writing is a fascinating practice. I’ve found writing to be it a marvelous opportunity to get to what is true and authentic for me. My astrology column is both a spiritual practice and it is a way to let others know about my consultation business. I sometimes even enjoy the process of writing. I love the discovery and connection. Yet sometimes I struggle with writing. I grapple with point of view and grammar. I grapple with metaphor and at times my ego. There’s a lot of grappling that goes on as I sit down to write. There is a lot to notice. I begin this week’s forecast talking about writing because I want to get to a realer place and must address the elephant that is always in the room when I sit down to write, or sit down with a client, or offer teaching. The elephant is culture, class, gender, and race. The elephant is that all these things influence my astrology and I rarely overtly acknowledge it. But I do grapple with it. Each month I choose an intention to follow through a lunar cycle. I hope that my intention will inspire others to create something along the same lines for themselves. I also hope that as I share what the intention is doing for me, readers might take inspiration for their own journeys. It is about possibilities, not certainties. Energies (planetary and seasonal) are present, what we do with them is completely up to us. And there, that sentence gave me pause. Am I expressing a “white myth” when I say that what we do with any energy is completely up to us? I recognize echoes from the myth of bootstrap individualism (Our destinies are up to us and we can do it alone. ), and is that what I mean? Probably not, but there you have it. That myth influences me. It creeps into my language even when I don’t want to perpetuate false myths. So I grapple—Can any statement be universal? I have a lens and yours may be different. How much translation is required for you when you read that sentence? Is there another way to express the influence of choice even when our realities are quite different from each other? How can I make the words more meaningful? I love astrology. I love the wonder of the sky and the connection between sky and earth. I love the ways people have always told stories about that connection. This love is why I want to share my elephants and acknowledge the limitation of my language and my contexts of culture, race, class, and gender. I want to get to a real place and then offer that to you (and to myself). I don’t have the answers, but I want to be clear about the questions. We are halfway through the Pisces lunar cycle. The Pisces season offers an opportunity to release old forms. This mutable water sign helps us shed influences of the past, not entirely, not forever, but enough, so that we are able to put our energies into re-emergence when the Aries season begins at the Equinox. What do you need to shed? What feels old, like an encumbrance, to where you want to go next? The elephants in my mental room feel like barriers to authenticity. I can’t shed them entirely. They will always be there as I continue to grapple with communicating astrology’s wonder. But I want to acknowledge they are there. My lens is flawed by privilege and systems of oppression that I did not personally invent but that I reinforce unintentionally every day. I long for a Spring where that influence is lighter, where systems of oppression are no longer the tool of greed, where I can more consciously resist my collusion with those systems. I speak this desire into the cauldron of this lunar cycle under a Full Moon in Virgo. May the healing waters bring transformation. March 12—Full Moon: Blossoming. The lunar cycle, so far. has called for subtle and paradoxical discernments. Each New Moon we plant seeds of desire. This idea of setting intention implies the use of will or focus to achieve an end. This month, that desire may have been even stronger for you. The influence from cardinal sign planets has reinforced willful action to reach an outcome. However, the Pisces (mutable sign) influence of this lunar cycle encourages a relaxation of will and effort. This is about going with the flow. In the Northern Hemisphere, we are perched on the edge of Spring’s awakening. Pisces says, “Let go, before you start up again. Get rid of unnecessary baggage before the wheel of the year turns towards growth.” These contrary influences between cardinal signs and mutable signs may have left you confused or tense. I feel both wound up and tuckered out at the same time. This is a great opportunity to notice our patterns around process and outcome. Do you feel more comfortable with the pursuit of a goal or with reflecting on how things are going? The balancing and illuminating influence of the Full Moon encourages moving away from one or the other into synthesis of both approaches. It is very helpful, right now, to let go of comparison to other people and to the voice that says how we should do things. What is progress after all? How do we know, except through our bodies, where we are? Whose body will you listen to? 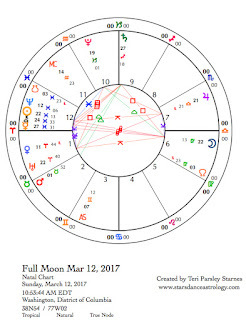 In the chart for the Full Moon, cardinal influences come from a tight and tense t-square aspect pattern. Jupiter in Libra opposes Uranus in Aries. Both are square to Pluto in Capricorn. Jupiter has been spending longer than usual at this position due to a recent retrograde station. Jupiter is forcing us to wake to the injustices and imbalances that are no longer acceptable. Uranus in Aries sounds the wake-up call. We feel a sense of urgency that may be hard on our nervous systems. The square to Pluto increases the stakes. Pluto is about ultimate reality. As the god of death, Pluto does not mess around. The stakes are high. The questions are, Will we survive? Who will be left in charge if we do overthrow the current systems (Uranus/Jupiter’s desire)? Can we trust any power? Pluto also offers clarity. We know what truly matters. We are willing to let what doesn’t compost into new forms. This t-square has been influencing us for several weeks due to Jupiter’s recent retrograde station. Pressure is strong. We have not yet emerged into Spring but the sap is ready to rise. Contrast that t-square with another one involving the mutable signs. The Sun in Pisces opposes the Moon in Virgo, both are square to Saturn in Sagittarius. The Sun orients us to the season of Pisces where we are invited to let go. This process is quite different from the cardinal Pluto process of confrontation with death and transformation of power. The Pisces process is a gradual opening to awareness that we can’t do it all even when our hearts feel it all. The goal is to surrender into the ocean of connection. The Virgo Moon says, “Wait a minute. What is the pragmatic response? We can’t all simply dissolve. Surely there are things we can do to bring about healing?” The line of tension between the Sun and Moon forces us to go in Saturn’s direction. The choice here, and mutable signs always present choices, is about commitment to truth. Is truth mutable? Can facts be alternative? Or do we base our choices on irrefutable truths? Where is the line that divides personal truth and universal truth? Where is your anchor in this? Collectively, we are confused about truth (Saturn in Sagittarius) and salvation (Sun in Pisces) and the ways forward that are holistic and balanced (Moon in Virgo). Venus is moving retrograde now creating another layer to complexity of the moment. In Aries (cardinal fire), Venus wants action and justice. Gender issues are hitting us more deeply. The desire may be to fight but Venus is also inviting us to go deeper as this planet heads back into Pisces. The Pisces lunar cycle begins to wane today. On March 20, the Sun enters Aries. The shedding of the Pisces season is a brief opportunity to let go of the things that no longer serve emerging life. This process can be messy. It can require more solitude. It can require asking for help. Be gentle with yourself. The things we shed may no longer serve but that doesn’t mean we shouldn’t grieve them. That is a vital part of this process too. The ways we honor our endings help us set down powerful patterns for our beginnings. 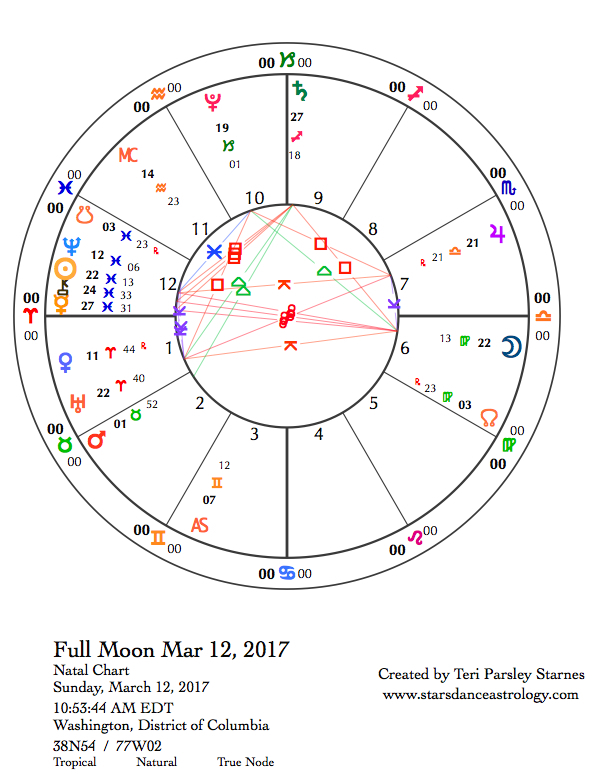 The remainder of the Pisces lunar cycle forecast will be posted March 13. To read about the beginning of the Pisces lunar cycle go here Contact Teri at teri@starsdanceastrology.com and visit her website at www.starsdanceastrology.com to learn about booking a reading of your chart. "Like" her Starsdance Astrology page on Facebook to receive these forecasts daily and learn of other offers and events.